Miatacage.com. What do I get when I order a MiataCage.com custom roll cage kit? What do I get when I order a MiataCage.com custom roll cage kit? 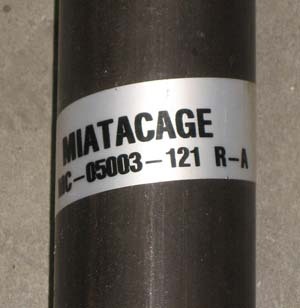 Below is a listing of things you get when you order a MiataCage.Com custom roll cage kit. The very best roll cage for your Miata. For over 10 years now we have been the leading supplier of custom roll cage kits in the industry. Get the original, not a copy! All tubes, gussets and plates needed to install your roll cage kit. No runs to the hardware store for parts that should be included. Clear and consistent identification of all part numbers. All tubes come with a sticker identifying the part number for each piece making your installation process go smoother. There is nothing more frustrating than trying to determine which part is which during your install process. We have taken all of the guess work out it by very clearly identifying each tube with a sticker that corresponds to 1 of the 4 detailed schematics as well as the checklist. Whether you are doing your own install, or you are having a fab shop do it we realize that time is money and we wanted to make things as easy and efficient as possible. 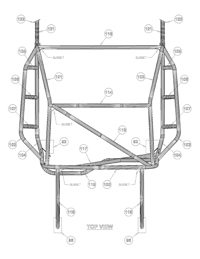 4 detailed schematics of the roll cage kit from different viewpoints all with part numbers. Vehicle preparation document in PDF format that shows you how to best prepare your vehicle to make the installation of your MiataCage kit the easiest and most cost effective. This gets e-mailed to you upon order placement so that you may begin the preparation process while waiting for your shipment to arrive. This document shows what parts to remove and modify, how to gut the doors and much more. Checklist for all parts in your box, so that upon arrival you can make sure all parts made it to you in the box. Sometimes shipping issues arise and parts could be lost due to box damage or shipping mistakes and we want to limit any potential interruption to your installation process. Installation guide with over 50 pictures and step by step process for how to install the kit. This is the most comprehensive step by step guide on the market. This installation guide was written from a fabricators point of view helping to save your fabricator (experienced or not) time and in the end saving you money. Free 4 Sale listing. If you ever decide that you want to sell your car, MC will post it free of charge on the MiataCage.com web site with no commissions or fees of any kind. Single box shipment that gets delivered via UPS. No fly by night discount carriers to save $2.00 and then lose your package. Every shipment gets a tracking number so you can trace and prepare for you package throughout the shipping process. Environmentally conscious packaging. We use 100% recycled cardboard for the box construction and then fill the box with recycled newspaper for packing material. No styrofoam peanuts or foam products! Copyright © 2019 Miatacage.com. All rights reserved.